This busy little bee likes to keep things moving! She loves being active, whether she’s swimming, sports, riding her bike, doing exercise programs, or making bracelets and art projects. 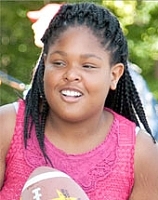 She attended camp recently and had a great time being outdoors and playing with her peers. Listening to music is another of Ayana’s favorite things to do, and she even sings in her school choir. She is working on making friends at school these days. She does best when provided with consistency, concise instructions, and honesty. She needs a family that can be firm yet affirming and nurturing. Might you be the family for Ayana?